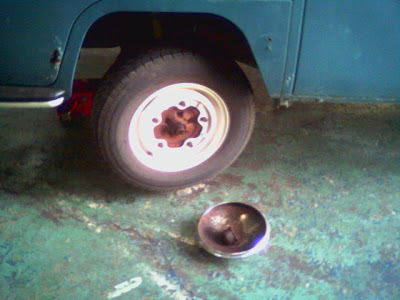 Today, on my way to work, the front wheels started vibrating and making a horrible noise. So I got on the cell and called Paul at Valley Wagonworks, who said to bring it in. When I arrived, the noise had become much worse. Paul (now sporting a beard for the first time in his life) immediately brought it into the shop, jacked up the front end of Blue and spun the wheels by hand. The front right had no trouble, the front left could barely move. 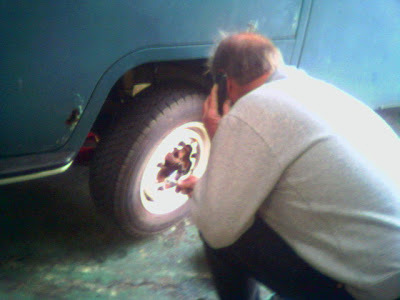 He pulled out the spindle nut (of which, the threads are the wrong way, Ludwig's drivers were correct in the comment on this post), pulled the wheel off and the wheel bearing was shot (outer bearing, the inner bearing was fine). 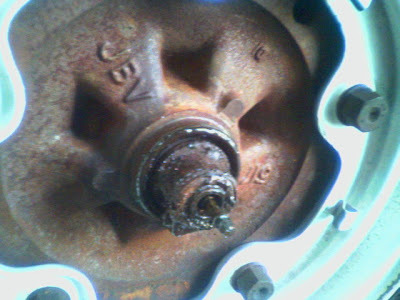 Water had gotten inside and rusted the bearing. I'm thinking this may have been a result of the January 3rd flood we had in our marina, when water came up over Blue's wheels. 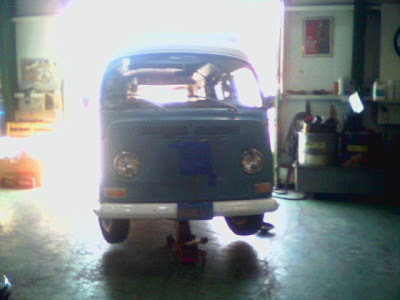 At any rate, Paul had the bearing, stamped it in some grease, put it all back together, let the jack down and Big Blue was fine. Best part was catching up with Paul and hearing some of his early VW experiences. Second best part was the, "no need to pay me, I'll catch you next time" when I tried to pay him. I've said it before and I'll say it again, the man is awesome. A half hour in and out and I was back on my way. Blue jacked up in Paul's shop. Rusty crap instead of nice axle grease. The man at work, one-handed, while talking business on the phone.